T warting Mobile Underwater T reats hile underwater ve- 1. Drogue pulls net from hicles can be used to 1. Wtions safer and more 2. Net self sets to form barrier ef? cient, there is also an increasing from seabed to surface. threat posed by underwater vessels and divers for operators of ports and 2. 3. At 20 knots net takes 6 ships carrying sensitive cargoes; cruise seconds to deploy. ships, fuel/chemical tankers and war- ships. While there are a multitude of 4. The target UUV/ diver collides potential detection and mitigation with the net and becomes solutions, Maritime Arresting Tech- 3.
nologies (MAT) was approached by the U.S. Navy to devise a non-lethal counter measure that could be de- ployed once an underwater threat was detected. The initial brief envisaged a detection range of 500 yards for a 4.
target traveling at up to four knots. In the best possible case this gives secu- rity forces three minutes to contain the threat. The primary asset available to deploy countermeasures is a small (28- ft.) patrol boat. 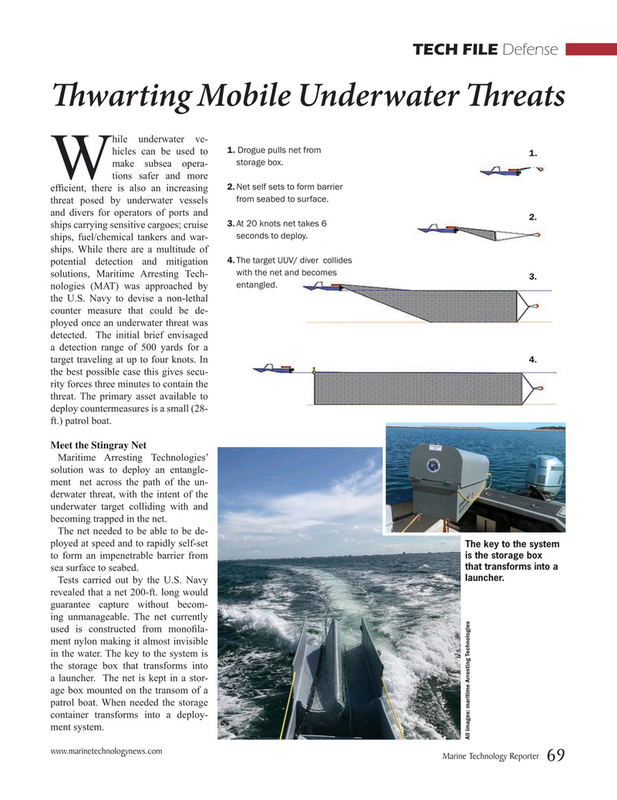 Maritime Arresting Technologies’ solution was to deploy an entangle- ment net across the path of the un- derwater threat, with the intent of the underwater target colliding with and becoming trapped in the net. The key to the system is the storage box to form an impenetrable barrier from that transforms into a sea surface to seabed. Tests carried out by the U.S. Navy revealed that a net 200-ft. long would guarantee capture without becom- ing unmanageable. The net currently used is constructed from mono? la- ment nylon making it almost invisible in the water. The key to the system is the storage box that transforms into a launcher. The net is kept in a stor- age box mounted on the transom of a patrol boat. When needed the storage container transforms into a deploy- ment system.